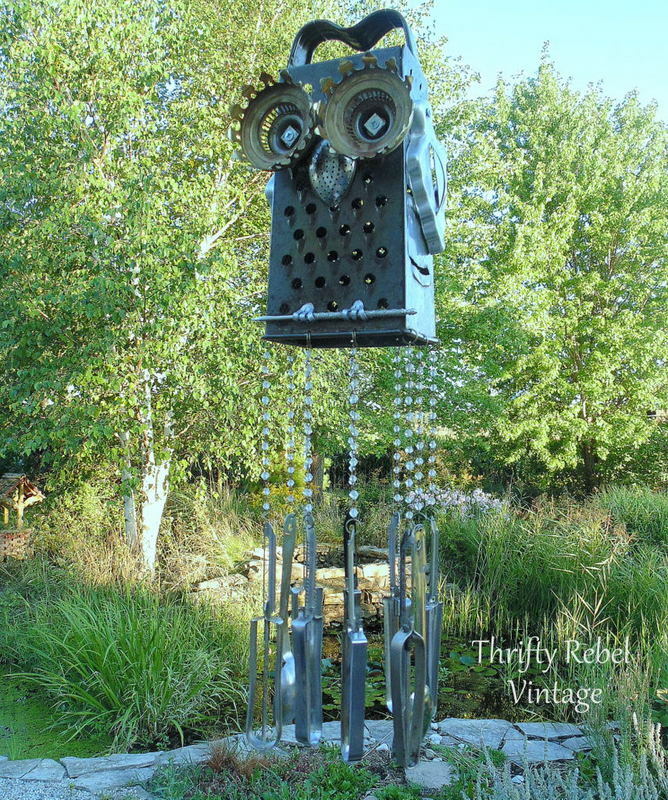 I’ve been wanting to make a junk owl for a long time and I’ve been collecting other people’s junk from thrift stores and garage sales to do just that. And because I’m a girl who pretty much sees a wind chime in almost everything this had to morph into a wind chime project. One of my favourite things to do is make stuff out of other stuff, and I’m pretty sure I’m going to love making these forever. 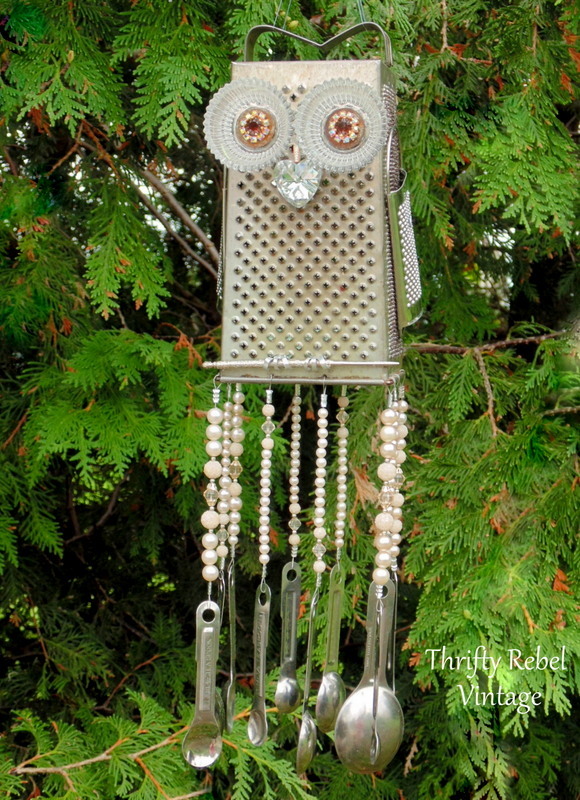 There are so many possibilities and combos to make every junk owl wind chime one of a kind. The first thing is to measure around the grater and figure out where you want your chimes to hang so they look equally spaced. Then mark those spots with a black marker. 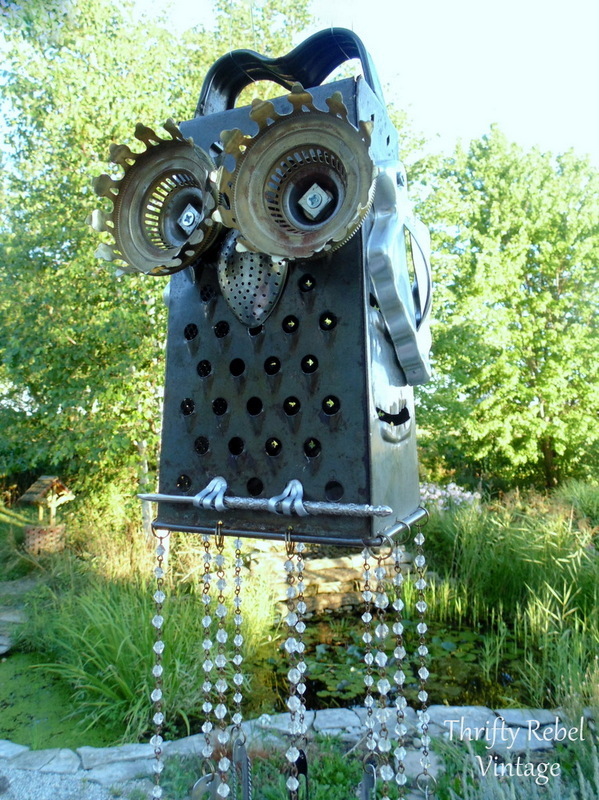 My junk owl is having ten chimes. If you want less just measure and mark accordingly. Then put the split rings into the holes. 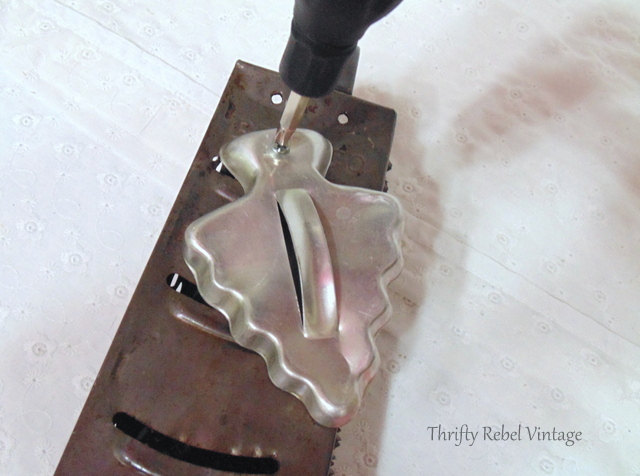 The two vintage Christmas tree cookie cutters are added next as the wings. I drilled a hole the size of the bolt I’m using through the cookie cutter and the grater. 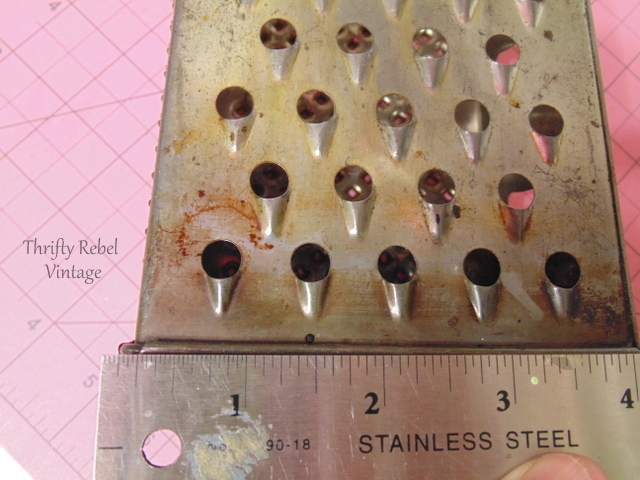 Then I fed through the bolt and attached the nut on the inside of the grater. I tightened it up with a screw driver just enough so the wing doesn’t move, but not too much so the cookie cutter doesn’t get squished. Here are the nuts and bolts I used. The longer ones for the wings and the shorter ones for the eyes below. 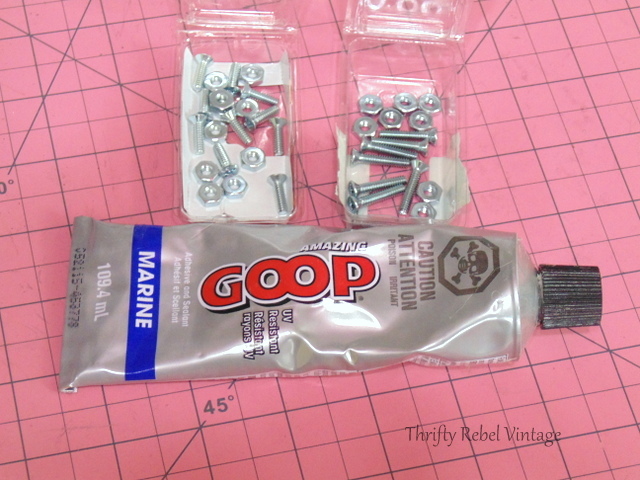 I’ll explain where I used the GOOP adhesive in a bit. Next I added the vintage beaded necklace parts on the split rings and added split rings to their ends. I attached the oil lamp part eyes, and the tea strainer nose, with Marine Goop adhesive. After the goop dried I drilled holes through the eyes and added the nuts and bolts. Marine Goop is a very good glue but the eyes are kinda big and bulky so I just wanted to give them a little extra strength. You can just see the handle in this pic and you’ll notice that I bent it to look like owl ears. I did this very gently with a hammer and my hands helping it as I went until I had it the way I wanted. This handle was a bit thicker than some so I really couldn’t bend it as much as I would have liked, but I think it looks ok.
Now came the fun part… NOT! lol. I had planned on hanging ten veggie peelers, but I was only able to drill a hole into eight. No matter what I tried these two seemed pretty much inpenetrable, and I barely made a dent in them. So, it was on to Plan B. 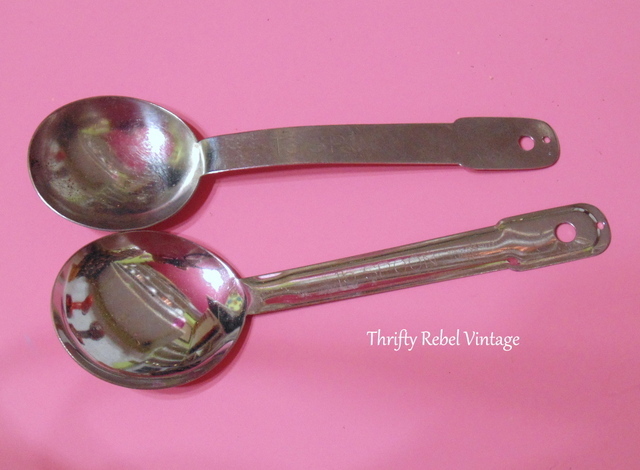 Which was two long stainless steel measuring tablespoons. They were very easy to drill into. Before I attached all my chimes I really wanted my owl to look like he was sort of resting on a branch… so I went looking through my stashes to see what I could find. 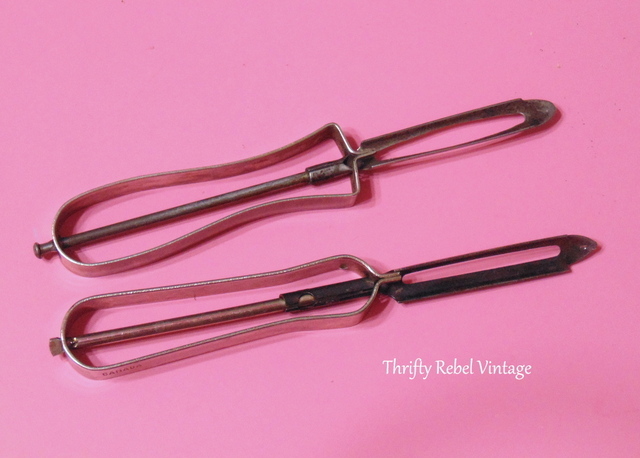 In my vintage nut cracker collection I found a bunch of picks, and I thought they could work just fine. Before attaching the pick I used pliers to break off a bit of the sharp end to make it nice and blunt. Then I glued it on with Marine GOOP just below a row of grater holes. 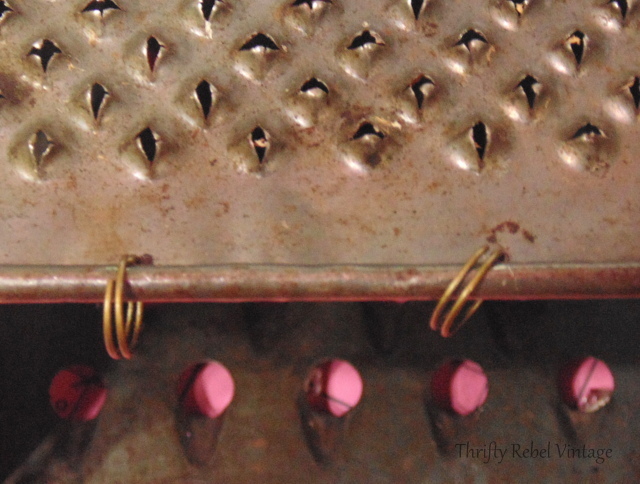 For the feet I used a very soft metal vintage tart tin that was very easy to cut with regular scissors and I glued the three toed pieces on the inside of the grater through the holes. I used painters tape to hold everything in place until the glue dried. 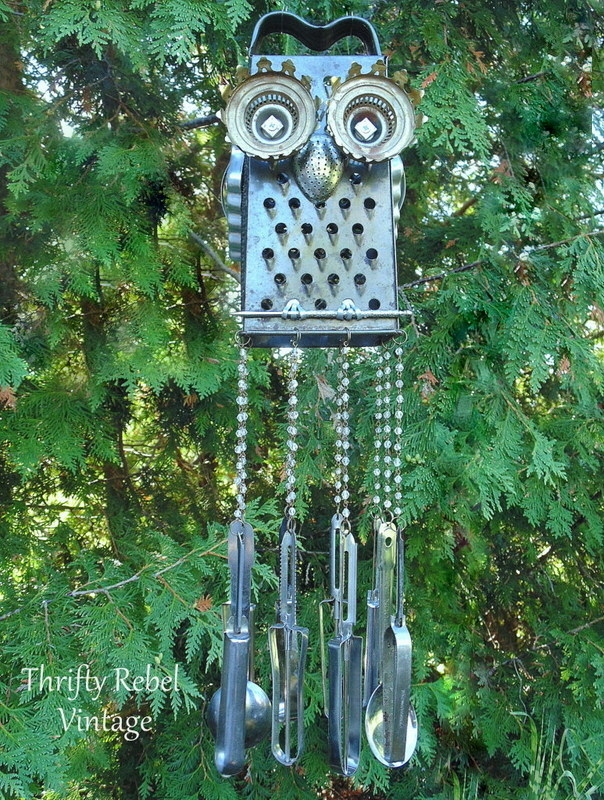 And here’s my finished junk owl wind chime hanging by the cedars next to my green house/junk storage house. I hung four veggie peelers across the front and four across the back, and one measuring spoon on each side. I’m a symmetrical-loving kind of girl so I liked the way this looked. And here he is hanging out by the back deck . I used fishing line to hang him from his ears because it’s pretty much invisible to the eye, but you can see it a bit in the pics. I thought about adding something to the eyes (and I even dry fit a few different ideas) but I just kept coming back to this original look, and I decided that I kinda love him just the way he is. 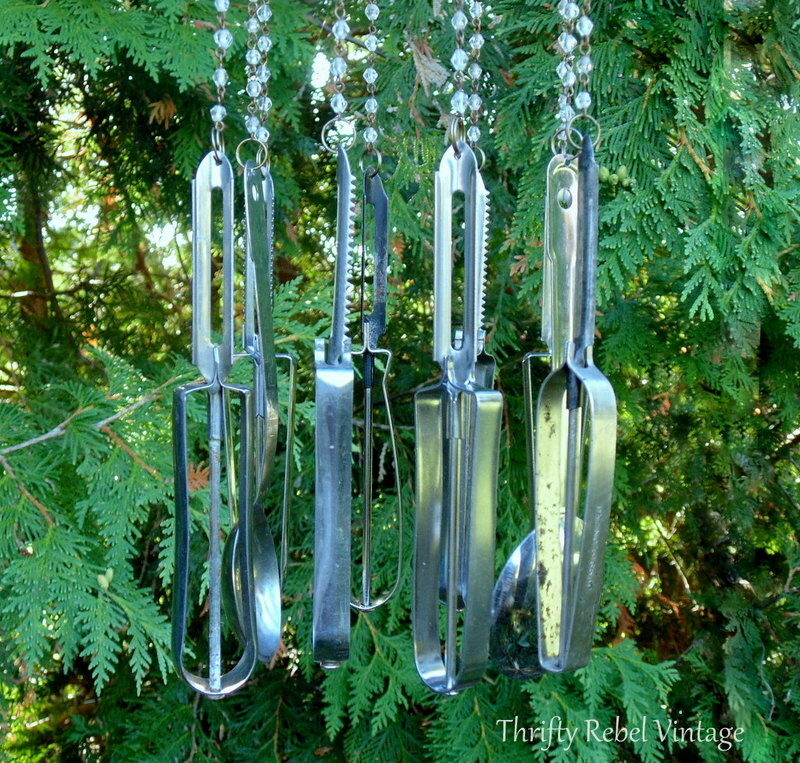 When making wind chimes I love using different things for the chimes and these veggie peelers have a nice soft tinkle to them when they hit each other in the breezes, and the two measuring spoons add to this tinkling quite nicely. 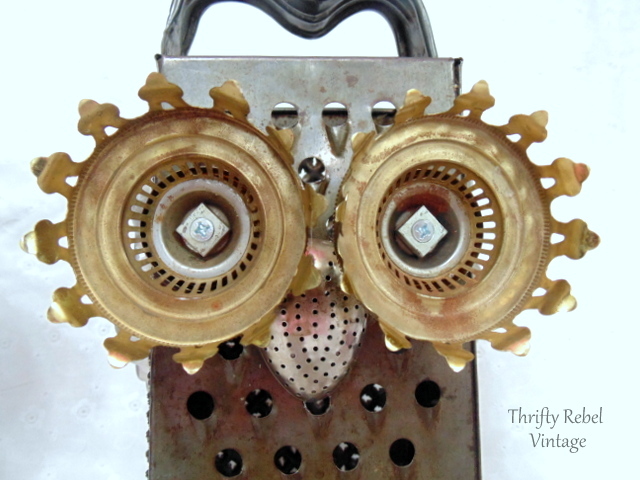 I had so much fun making this junk owl chime that I’ve already made a few other versions using different junk. Here they are. 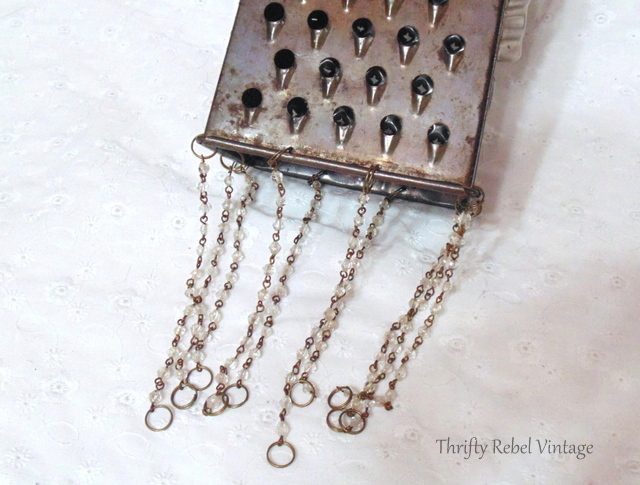 They’re all made basically the same way, but I used measuring spoons as the chimes. 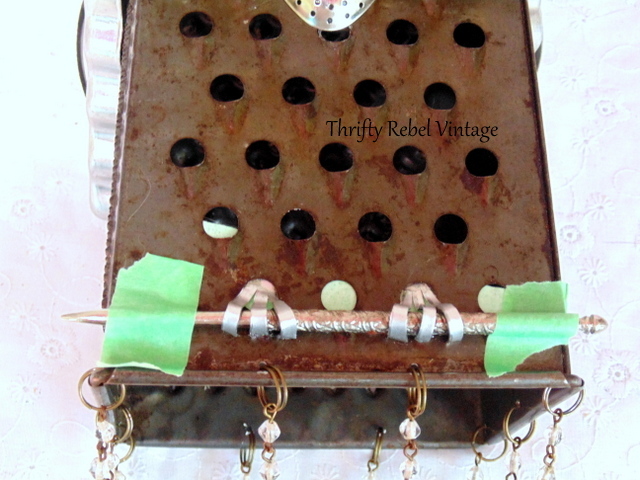 Repurposing stuff is what I love to do for fun, and making wind chimes is one of my favourite things to do. When I can marry these two things together in one project… well that is just a total blast. If you love owls and you enjoyed this project, you might also enjoy my repurposed Owl fall door decor project. Pin to your favourite board and share with your friends. In case you missed them here are a few of my other wind chime projects. What a Hoot. That is quite creative and looks absolutely awesome. He’s so cute !! You are a junkin genius! Thanks very much! I know what you mean about scraps. I’ve got a lot of junky stashes around here, and I really need to start using them up. Once I get going it’s really a lot of fun. I was thinking for the eyes you could either spray paint with glow in the dark paint . I’m pretty sure it’s available in a paint form. I just thought it would be cute at night? That’s a great idea Pam! absolutely love your owl…and pretty much everything else i’ve seen on your blog…..love the way your mind works. We’d be junking buddies if we lived near I’m sure! Tuula, he’s perfect! Your wind chimes are the best! I absolutely love the way your brain works. Lucky for us, you share all this genius! OMG Tuula! He is so adorable!! 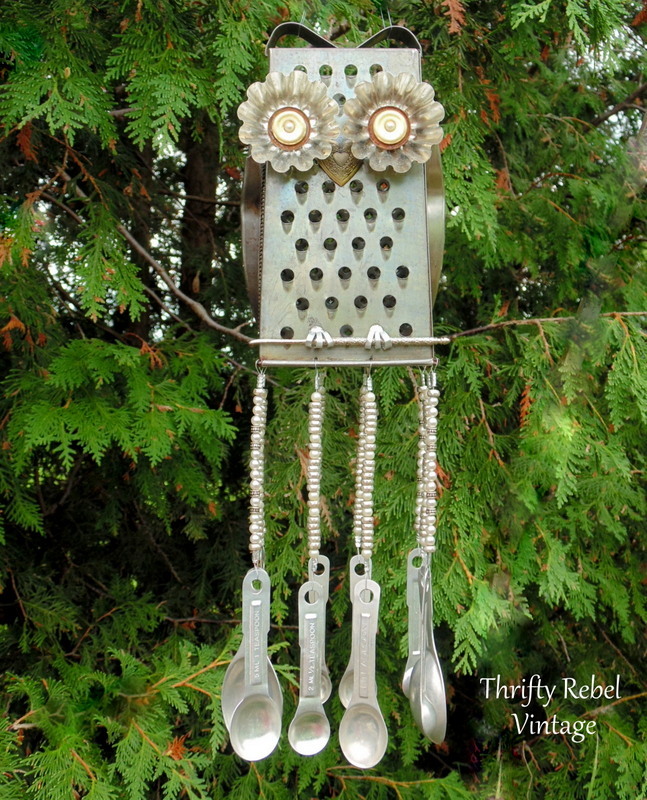 I’ve seen those repurposed owls and have been wanting to make some too, have you seen the ones made out of jar lids? They are super cute too! Thanks so much Tania! I haven’t seen the jar lid owls, but that sounds like a fabulous idea. Now that I’ve made a few of these my eyes I see so many owl possibilities. Thanks Dona! I absolutely loved putting him together, and have been hoarding graters to make more. I’ll be sharing the other finished ones soon. Wow Tuula! You have such a knack for wind chimes. Wish I had half your creativity! It looks great! 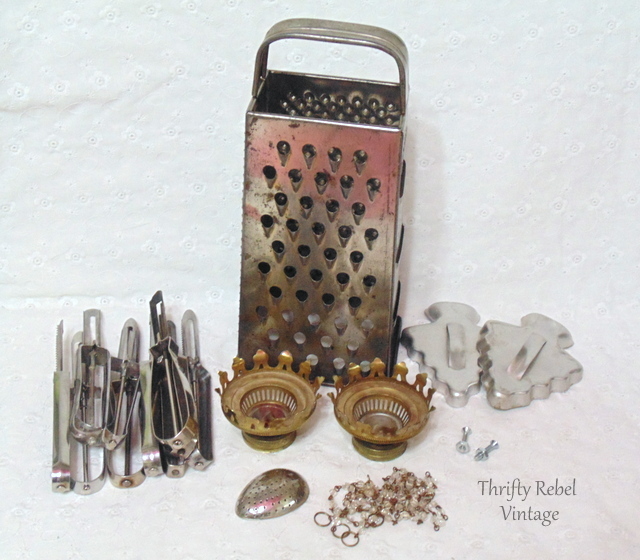 Do you put a sealer on the grater or any of the pieces to protect from the elements? Thanks Florence! I don’t use any kind of sealer because I love it when things age with rust and patina, but I don’t see why someone couldn’t do that if they wanted to. Adorable Tuula. Just makes me smile. Thanks Kris! Happy weekend to you too. Another winner – you hit this one right out of the ballpark! Great job! So cute! Love that you incorporate all your vintage finds into the final piece. Very creative! Thanks Judy! I really do enjoy repurposing things. It’s just so much fun for me. Thanks Tina! This one’s a keeper. Oh I am a bit in love. 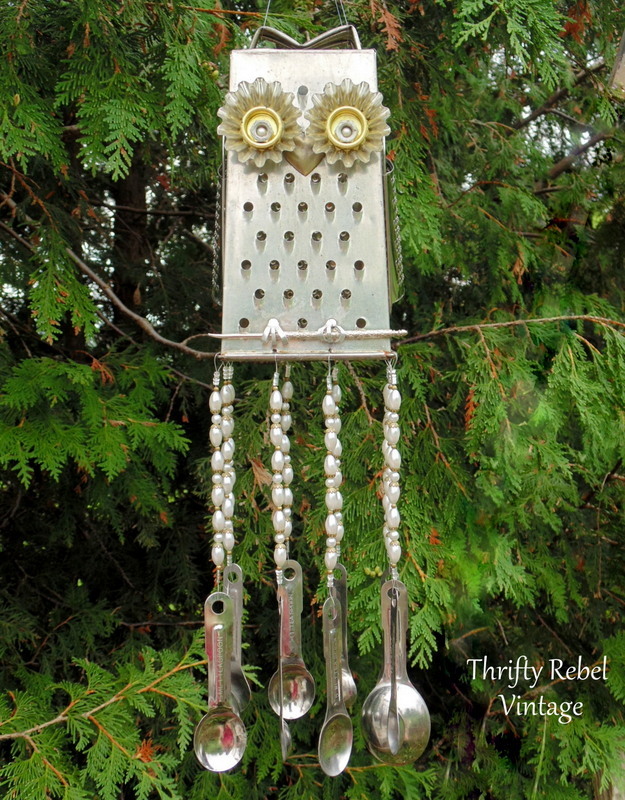 Your owl wind chime is adorable! Tuula, that is too adorable! I love owls. I love wind chimes. Therefore, I love this! He really turned out cute. 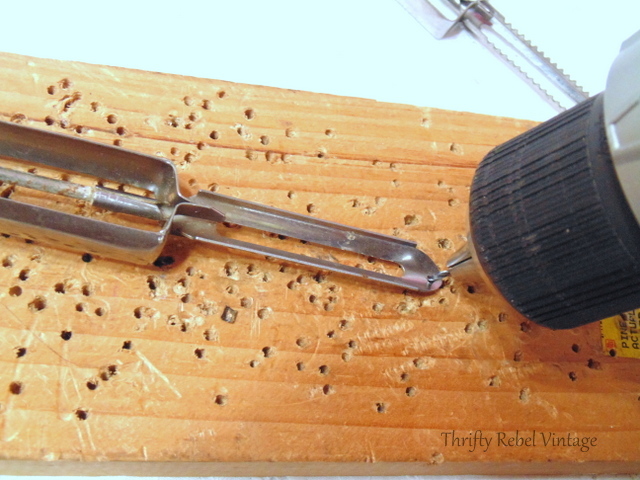 Do you use a special drill bit for the metal? I’m looking forward to seeing your other owls! Thanks Cecilia! 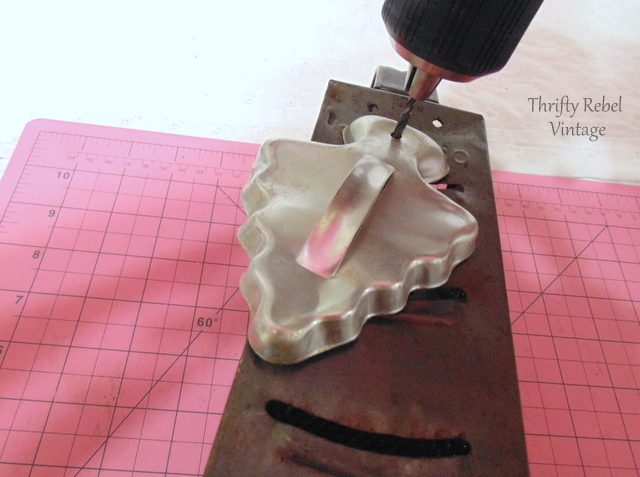 For this project I used a 3/64″ drill bit especially meant for metal. It works for most small items and thin metals. Every once in a while I’ll come across something I can’t drill through, like those two pesky veggie peelers, but I’ll just put them aside and move on. Oh wow how adorable! I love it! You are very creative coming up with a cute wind chime with all these different pieces, he is so cute! 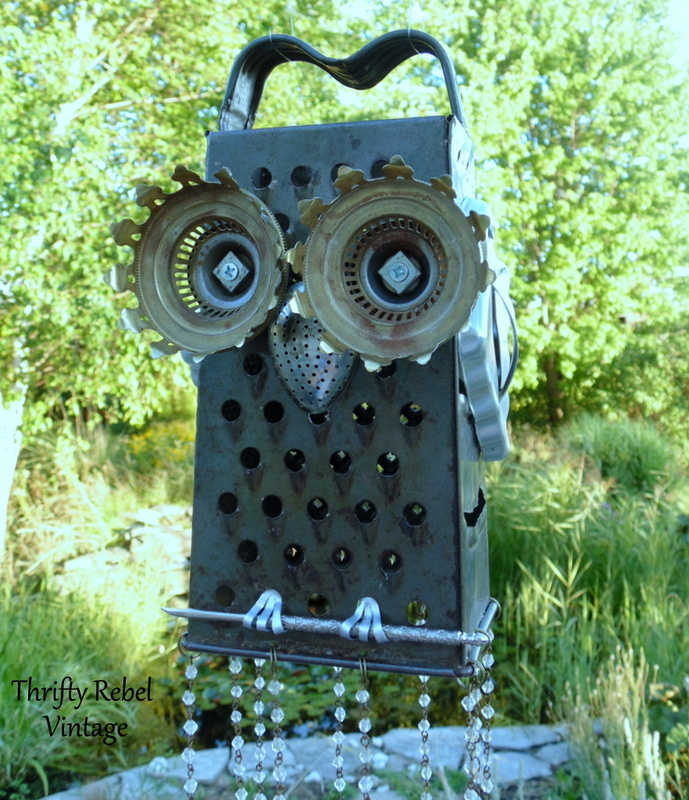 LOVE the eyes, now I will be looking at thrift store cheese graters and potato peelers through different eyes. Lol. Thanks for sharing! I still have a tin man …he needs work now, after almost 20 years! But he’s still hanging around. I think this is adorable…and want to see more of your creations! Heck, I might even make one myself! This is my favorite wind chime ever, Tuula! I LOVE it!!! Wow Julia. Thank you so much! You are always so clever! Thanks very much Carol! It’s always fun to join the party. 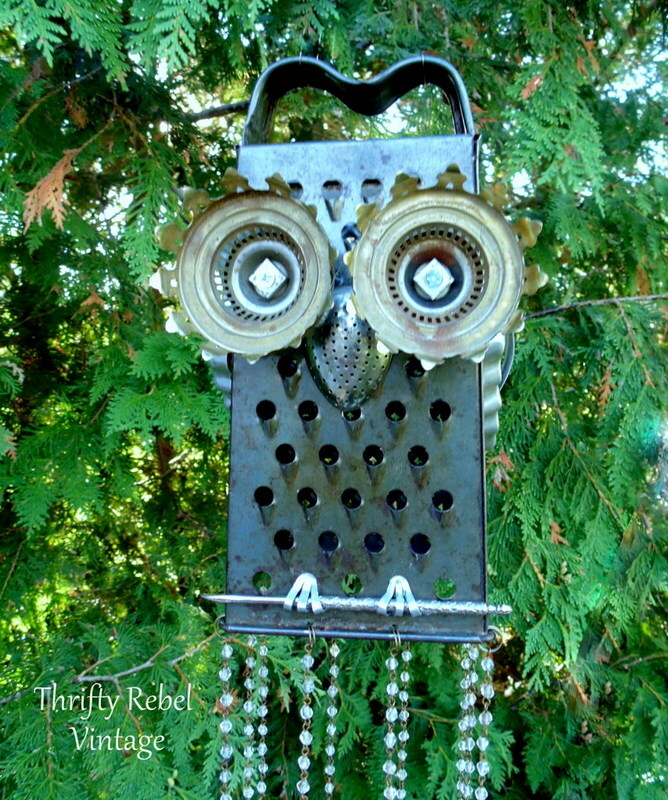 This is such a cool owl wind chime and a great repurpose! Love it a lot!! I adore this! I know I have some of these items and am going to have to try and recreate this for my porch. Thank you so much for your inspiration! Thanks Beth! I’m so pleased that my project has inspired you. OMG ! You are so creative! That owl is awesome ! I love Owls so I must copy this for my yard! He is the Bomb !!!!! Saw this on Sweet Inspirations…WAY TOO CUTE!!! I really love this owl! Such a creative and unique idea/project!! I’m pinning this! Thank you so much Monroe! How beautiful! I practically have everything I need to do this! Lol, you kept calling the wind chime ‘he’, I think they all look very definitely feminine!